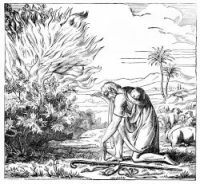 When the long trial of patience and solitude in the wilderness of Midian was at an end, God summoned Moses to his mighty task of rescuing the nation of Israel. One day the quiet shepherd led his flocks to "to the back side of the desert, and came to the mountain of God." 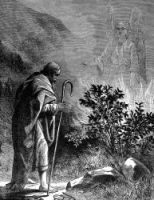 Here was suddenly before him a bush which flamed brightly, yet did not burn away; Moses went forward to examine this Burning Bush. As he approached, God or an angel of God, called to him from out of the flame and bade him take off his shoes, for this was holy ground. In awe and astonishment Moses obeyed, and then God Himself spoke from the burning bush and proclaimed His presence. God spoke of the misery of the Israelites, which had been brought them by their sins, and declared His intent to deliver them out of Egypt and lead them to a land "flowing with milk and honey," the land of Palestine. 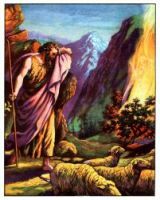 Moses was commanded to be their leader and to demand their release from Pharaoh. The Lord promised Moses that he would receive divine help, and foretold all the disaster which He would bring upon Egypt. Moses still asked for some visible sign by which he could convince the Israelites that he was no fase prophet. The Lord bade Moses cast down the stick that he held in his hand, which he did. The rod became a living serpent until Moses picked it up again and it changed back into a rod. Moses still hesitated to accept the mission, pleading a lack of eloquence. So God told him he should have his brother Aaron, a man of ready words, to speak for him. 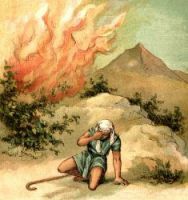 This series of images of Moses and the Burning Bush on Mt. Sinai are from my collection of antique Bible books. Feel free to use these pictures of the Moses Burning Bush in your projects. 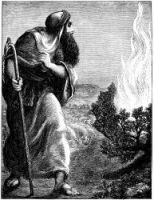 Click on the Burning Bush illustrations below to see more details about saving a free Moses Burning Bush image or about purchasing the images Moses and the Burning Bush at a higher resolution.